Located in the sought after Sleepy Hollow neighborhood, this gorgeous remodeled home sits gracefully on .65 acres & boasts exquisite interior & exterior spaces. With 5 beds and 3 baths, this approx 3,367 sq ft home features beautiful hardwood floors, walls of windows w/garden views. The formal living & dining rooms offer vaulted ceilings, custom built-ins, wood burning fireplace & access to the gardens. 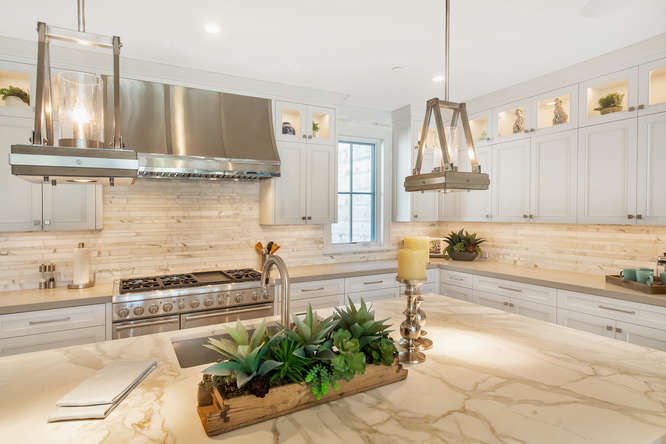 The chef's kitchen includes natural birch cabinets w/granite counter tops, large island w/prep sink & seating, stainless steel appliances and custom lighting. The family room w/French doors opens to the beautiful outdoor spaces; ideal for casual entertaining. 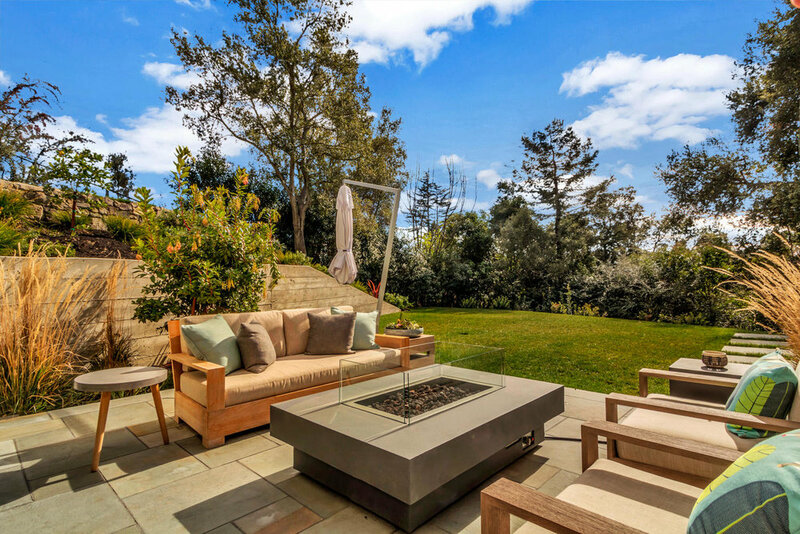 The Dana Lund designed gardens boasts flagstone patio, rose garden, maple trees, boxwood hedges and slate fountain w/staircase to the upper terraced gardens & views. The master retreat offers bay window w/custom built-ins, large walk-in closet & viewing deck. 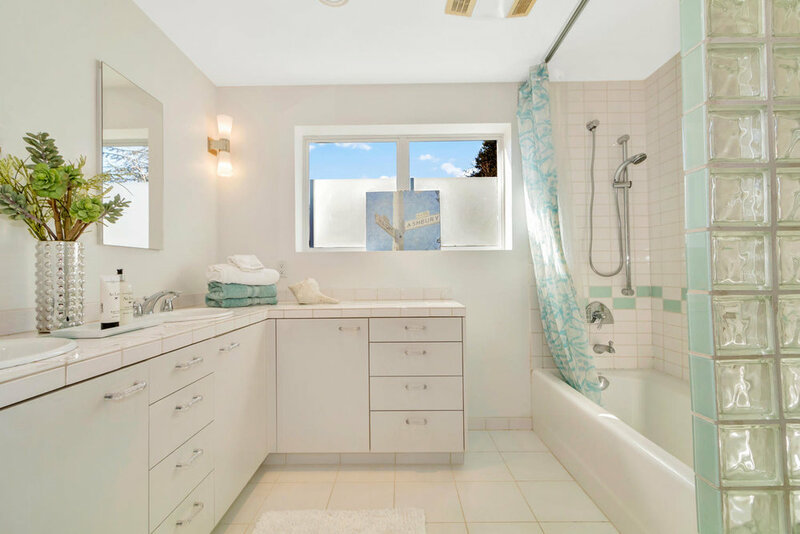 The master bath includes heated floors, marble counter tops, jetted tub & private shower. The additional 2 bedrooms & bath complete the bedroom wing. The lower level family room w/separate entrance includes fireplace, wet bar, bay window & custom storage center. Two additional bedrooms, one full bath & laundry and bonus room; ideal for au-pair or in-laws. Click her for the virtual tour. Located near downtown Lafayette is great home is close to schools, BART, everything Lafayette has to offer! The formal living/dining room spaces w/views of the garden offer wood burning fireplace, custom built-ins, large picture windows that give way to loads of light. The eat-in kitchen, fit for a chef, features, large island, granite counter tops, stainless appliances and easy access to the outdoor spaces...entertainer's dream. 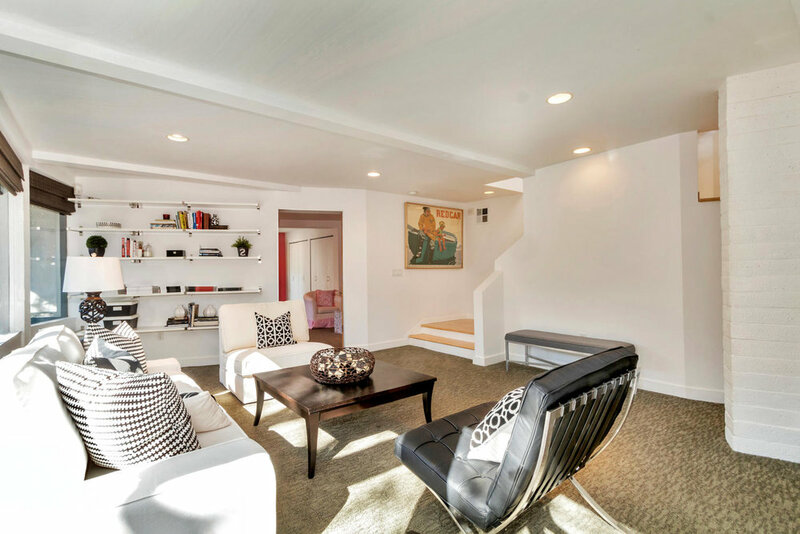 The spacious family room with adjacent 3rd bathroom and access to private patio could double as an au-pair set up. Set privately, the master suite boasts walk-in closet w/built-ins, access to gardens/spa, bathroom w/two sinks, private shower & office. Additional bedrooms feature spacious closets, garden views & share a bathroom w/separate tub and shower. Enjoy the fabulous outdoors spaces: spacious deck, large level lawn, planting beds, play space, hot tub, mature gardens & views & awesome second driveway! Top-Rated Lafayette Schools! 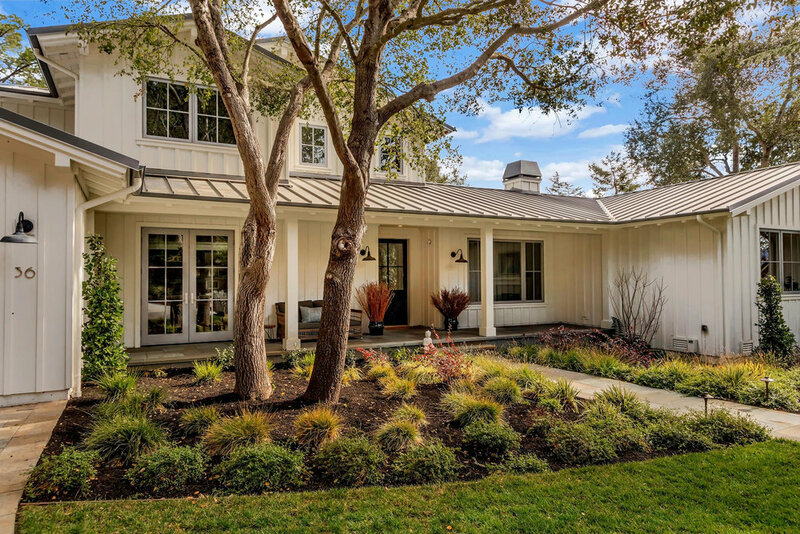 Built in 2016, this fabulous home in Orinda’s prestigious Country Club neighborhood showcases the graceful designs of renowned Architect Alan Page of Talon Design Group, superb craftsmanship by McKenzie Gray Builders, and a seamless flow to amazing outdoor spaces thoughtfully designed and effortlessly integrated with the contemporary Napa farmhouse style by Landscape Architect David Thorne. Spanning almost 4,000 square feet of living space, the two-level home features five bedrooms and four bathrooms, powder room, two family rooms, and office with fireplace. Inviting outdoor entertaining venues on two levels include Connecticut Bluestone walkways and patios, built-in barbecue, sprawling lawns, and terraced gardens surrounded by mature trees and privacy on a .48-acre lot. Custom finishes and quality crafted details flow from the grand entry and throughout the open floor plan illuminated in natural light. Features include high ceilings, European oak floors, oversized windows, gleaming marble and designer tiles, crown molding, and the exterior board and batten siding withan attractive standing seam metal roof. Gather with family and friends in the beautifully designed great room and adjacent dining room or extend the entertaining space by opening the double sliding glass doors to the expansive patios and gardens. Be inspired in the spectacular chef’s kitchen adorned with a stylish Calacatta marble island and breakfast bar, stone perimeter counters with textured Calacatta backsplash, custom cabinetry and Thermador professional appliances including custom stainless hood. Work from home in the downstairs office with glass pocket door and fireplace or relax in the upper level family room that is spacious and light filled with an oversized sliding glass door that conveniently opens onto an expansive patio and rolling lawns. The luxurious master bedroom suite on the main level is truly a retreat surrounded in stylish features including a vaulted tongue and groove ceiling and sliders to the backyard garden. 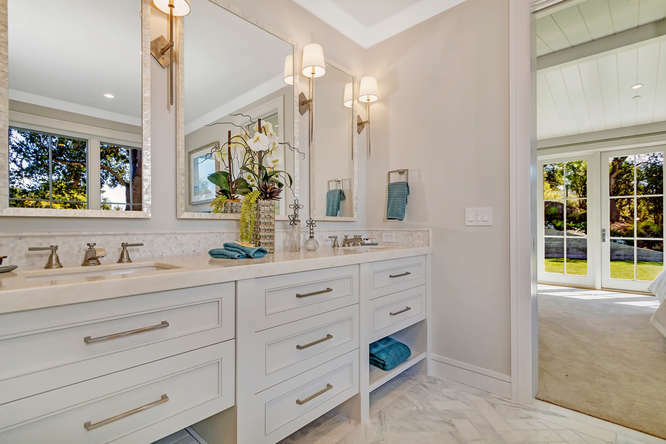 Its beautifully appointed and light filled bathroom is clad with custom details including stunning Walker Zanger white marble, radiant heated floors, detailed mosaics, private water closet and walk-in closet with linen-textured built-ins. Four additional bedrooms include two with en suite bathrooms. The coveted neighborhood is conveniently close to the historic and private Orinda Country Club with championship golf course, swimming, tennis and fitness facilities and clubhouse for casual and formal dining and special events. Enjoy top-rated schools in the Orinda and Acalanes school district, and easy access to the Orinda Village, downtown Lafayette, commute routes and BART. 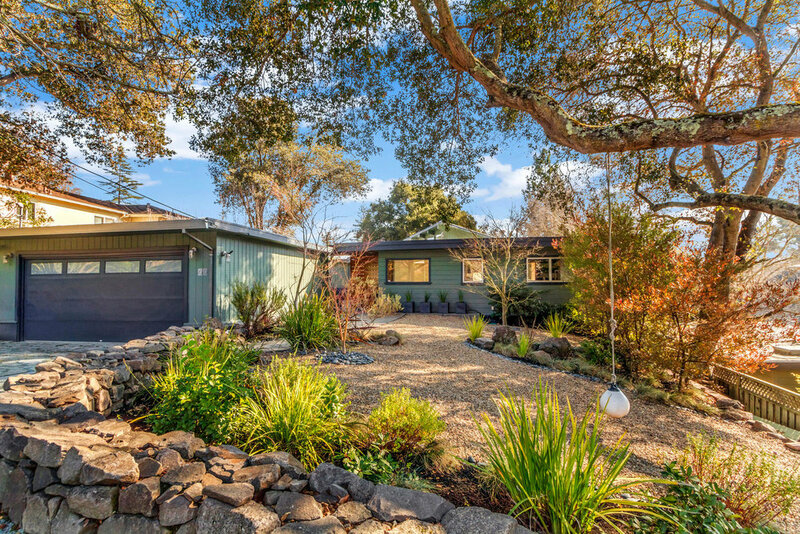 Mid Century masterpiece, meticulously remodeled while preserving the integrity of the classic style, showcases brilliant architectural detailing designed by renowned Berkeley architect Charles Debbas. The eight-month remodel featuring the superb craftsmanship of Mueller Nicholls cabinetry and Sonoma Cast Stone work was featured in Sunset Magazine in 2003. 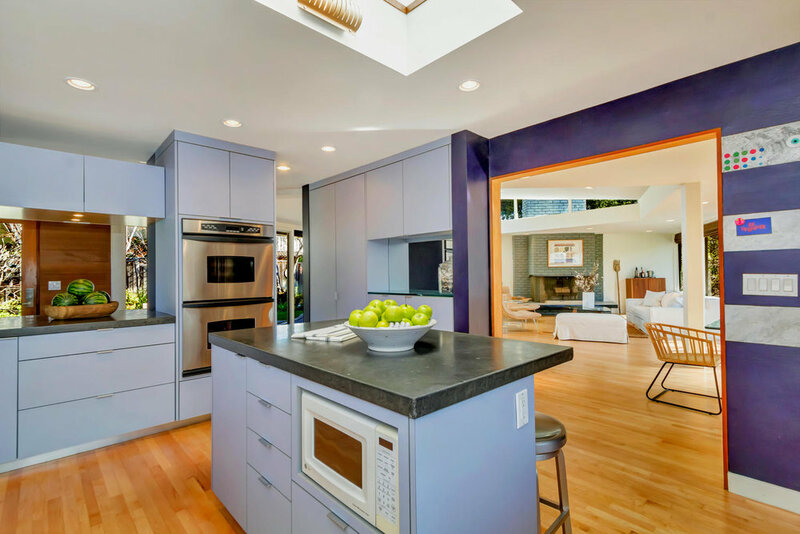 Located in the coveted Orinda Estates neighborhood, this almost 3,300 square-foot, two-level home with four bedrooms and four bathrooms including two master suites is filled with stylish finishes and an abundance of natural light illuminating every room. Expansive walls of glass create a seamless flow to inviting outdoor garden spaces and multiple venues for entertaining and quiet reflection under majestic redwoods on the almost quarter-acre lot. A custom circular-designed sunken outdoor patio creates an intimate gathering space for family and friends or ideal play area surrounded by the gardens planted with colorful foliage and drought-tolerant species. 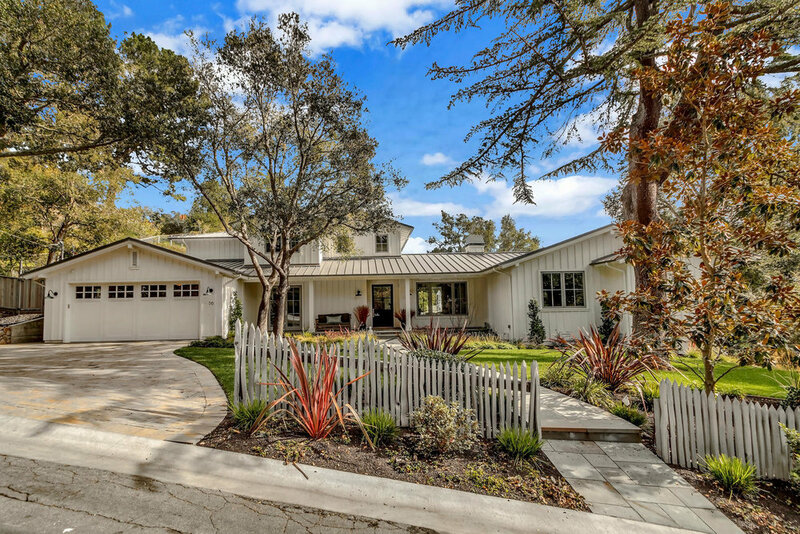 The front garden under the canopy of an oak tree is an inviting entry into the home that features slate tile and reclaimed redwood siding in the foyer and view of the wide-open and flexible floor plan ideal for today’s lifestyle. The living and dining rooms flow together under a vaulted ceiling with clerestory windows, original brick fireplace with floating hearth and sliding glass doors on two sides. Maple hardwood floors transition from natural to ebony through the gentle curves of a pebble floor adding an artistic feature while softening the angular dimensions of the room. The sophisticated and well-appointed kitchen offers lots of prep room for multiple cooks while natural light pours in from the skylight and windows framing front garden views. Concrete perimeter counters and island created by Sonoma Cast Stone compliment the custom crafted Mueller Nicholls maple cabinetry and the artistically designed glass-tile backsplash. 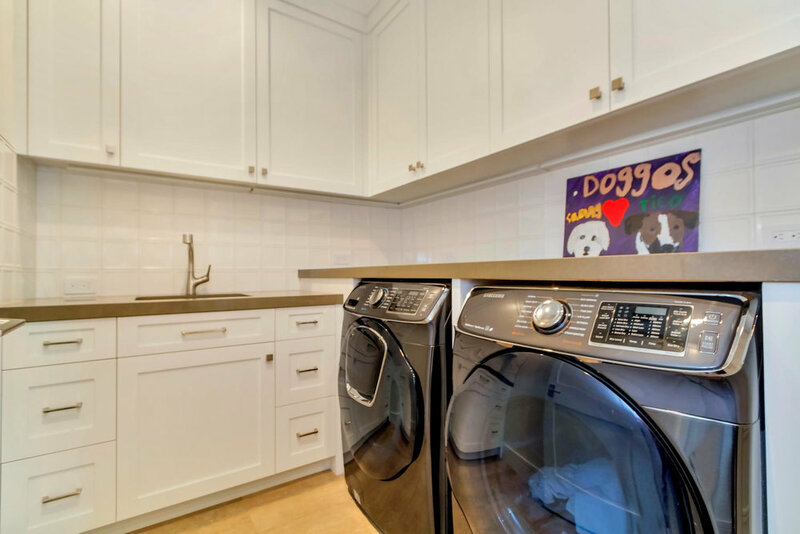 Stainless appliances include double Dacor ovens and five-burner cooktop with Broan range hood and stainless backsplash, and Bosch dishwasher. 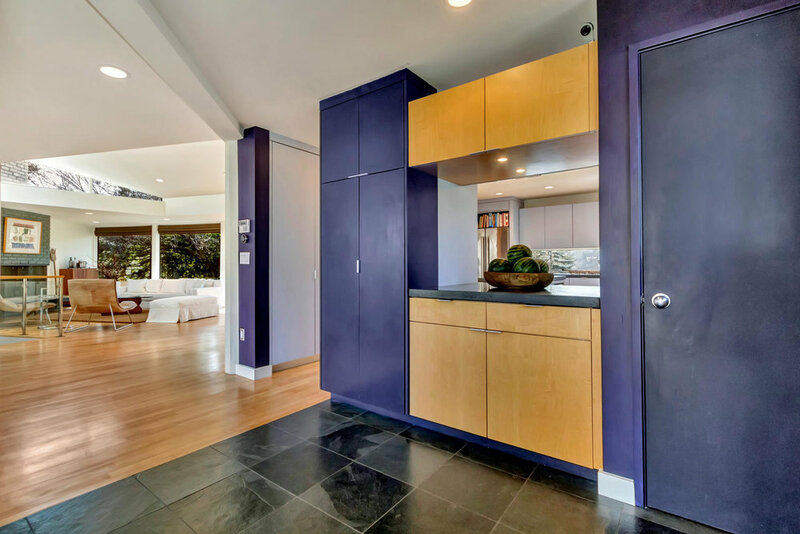 Four bedrooms include a main level master suite brilliantly designed with a wall of closet space behind maple doors, custom cabinetry and private access to the gardens through sliding glass doors. The bathroom is a work of art with slate tile flooring, corner jetted tub, skylight and custom designed dual vessel sink concrete counter that cantilevers through a window blurring the line between inside and out. An additional bedroom is on the main floor with nearby full bathroom featuring penny tile flooring. Downstairs is a spacious bonus/family room with fireplace, wall of windows and sliding glass door access to the gardens. Two bedrooms on this level include a possible second master bedroom with spacious sitting room space and full bathroom and an additional bedroom with en suite bathroom featuring a slate tile floor and custom beach glass counter. 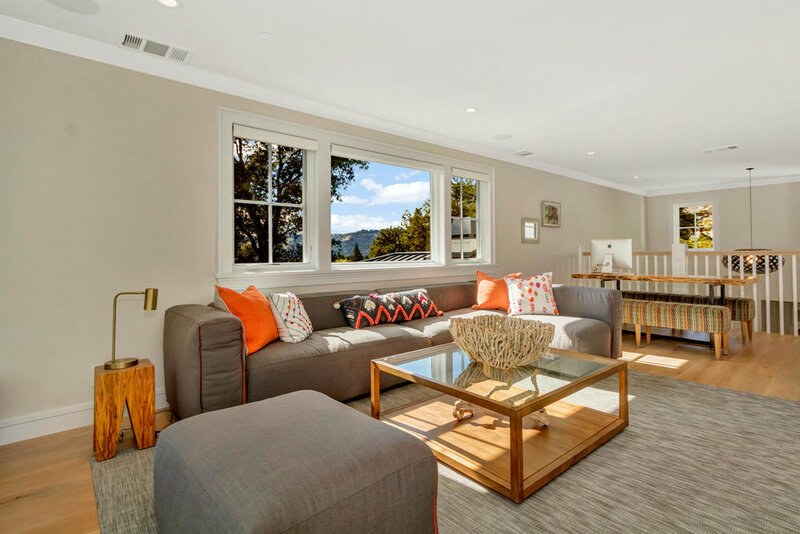 Orinda Estates offers a private and tranquil setting that is close to the Orinda Village with easy access to BART and Highway 24 and top-rated schools in the Orinda and Acalanes High School districts. Only about 20 miles from downtown San Francisco, the neighborhood is also close the Historic Orinda Country Club and outdoor recreation at the nearby Tilden and Briones Regional Parks. Let me take you on a personal tour! This is a home to awe and amaze, not just with its setting and design but in how it feels. The minute you walk in you can feel it soothing you, making you more calm and relaxed. The spaces are both vast and intimate, and you are never away from a view. Each room opens to the central area yet still has its own private setting. Truly a unique place to call home. Architects Jong & Jong of Berkeley, California have combined traditional Japanese design elements with contemporary living to create this exceptional home that is a true piece of art. Using innovation and imagination to blend nature with living spaces, this home is a place to find peace and balance, a place that promotes relaxation, appreciation of natural elements and provides a setting for both private and social occasions. This is a home that needs to be felt, not just seen! Upon entering, you look through bamboo trees growing up three stories to the huge central atrium with its soaring wall of glass reaching up three floors and then to the sky. It floods the home with natural light and uninterrupted views to the western hills. This expansive use of glass creates a space where both the indoors and outdoors meld into an astonishing blend of art, architecture and nature. The rest of the home is then tiered up and open to this amazing volume of space, light and views. Every element was carefully selected to make the home harmonious and elegant. The neutral colors and carefully chosen materials such as white birch and slate are consistent throughout giving the design center stage. The extensive use of shoji screens—lightweight screens that transmit light—creates rooms without walls and allows the flexibility for either an open flow or intimate spaces. The use of built-ins in every room also adds to this peaceful uncluttered feeling. The main level is the heart of this home. The living room takes center stage in the atrium, with its fireplace and access to the massive deck and uninterrupted views west to the Berkeley hills. It is an ideal space for taking in the wonderful views from dusk to dawn and for entertaining both indoors and out. The dining area features an amazing ebony table which can remain at standard height or be lowered for traditional Japanese dining. This central area is balanced with the kitchen area to one side and the master suite to the other. The kitchen is a cook's dream come true with granite counters, high-end appliances, and abundant storage and counter space. The large center island with cook top becomes the gathering place for casual entertaining. It is open to a family room with a wall of built-ins and a “greenhouse” area for casual dining including a built-in workstation. The side deck off the kitchen is nestled in the oak trees with a built-in bar-b-q and sink. On the opposite side of the house is the master suite. 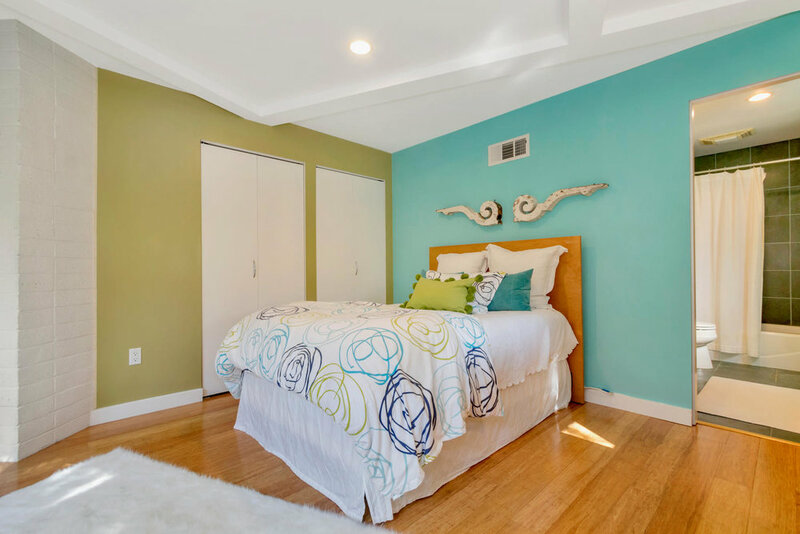 The generous bedroom has built-ins, walk-in closet and a private side deck with hot tub. The bathroom features a slate and glass double shower and a deep soaking tub. Up a tier is an open “bridge” hallway connecting both sides of the home, on one side there is an ensuite bedroom, another bedroom with private deck and another full bathroom. Balanced on the other side is an additional bedroom with private deck and a guest suite. On the uppermost tier is the spacious office/family room. This private sanctuary has its own “bridge” overlooking the atrium and fabulous views west. With its deck in the oaks, it is secluded yet still very connected to the rest of the spaces. The exceptional oak studded lot is located off a private road and is just over an acre abutting private open space which provides ultimate privacy and views. 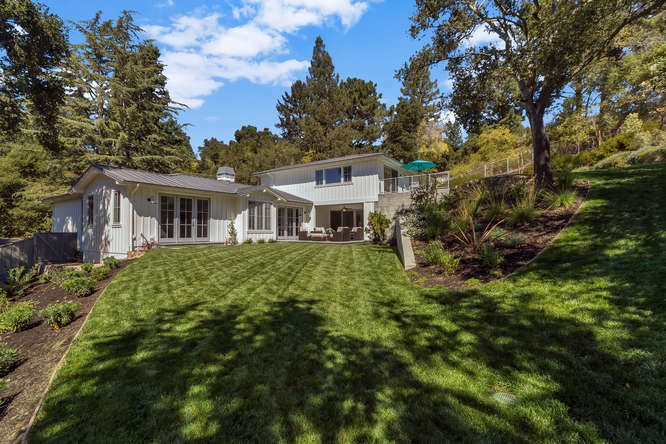 319 Tappan Terrace is in the Sleepy Hollow area of Orinda, one of the most popular locations in the East Bay offering twelve years of award winning schools, quick access to shopping, dining , BART, freeway and countless recreational attractions. New Listing! Spectacular California Contemporary in Stunning Setting! 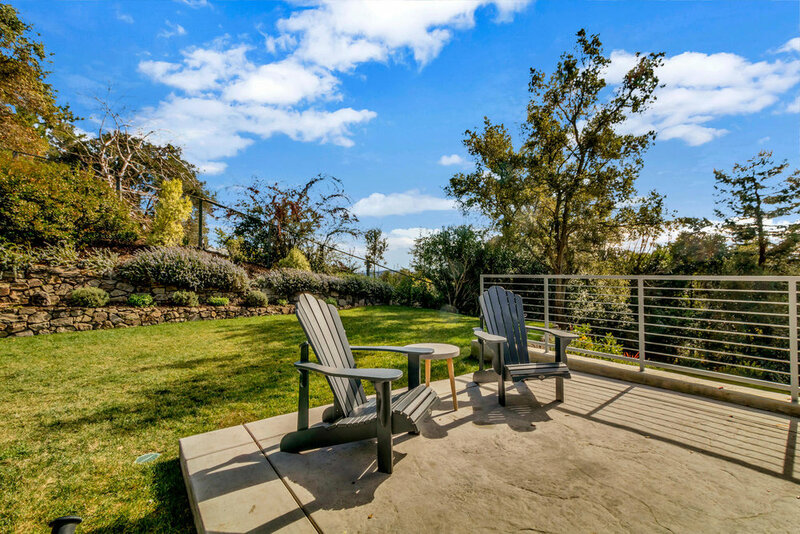 From the Zen gardens to the expansive views, this California contemporary will simply take your breath away. Nature and architecture merge to provide a sense of calm and warmth in the open, light filled spaces. Your family and friends will fall in love with this home’s function, flow and beautiful setting. 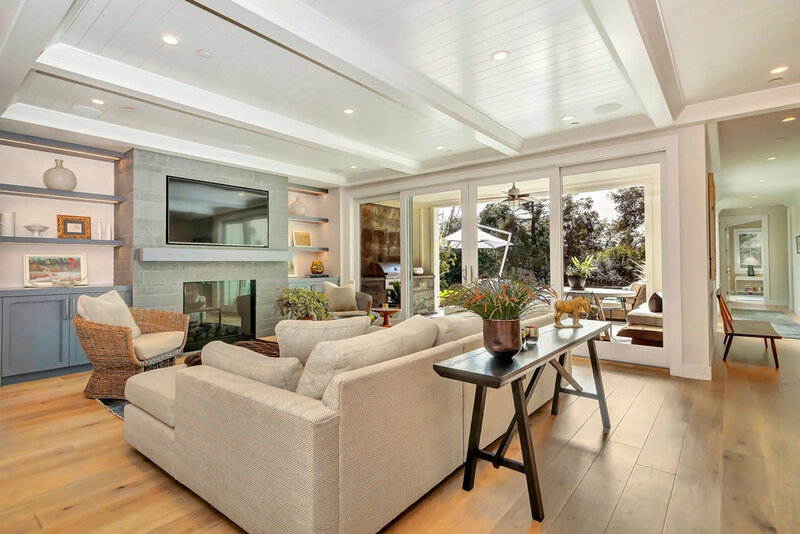 A yearlong renovation completed in 2015 touched almost every aspect of this custom designed estate on more than an acre of land in Orinda’s Glorietta-Overhill neighborhood. The owners moved out so that the magic of JP Builders and architect/designer Carolyn Van Lang could flourish. 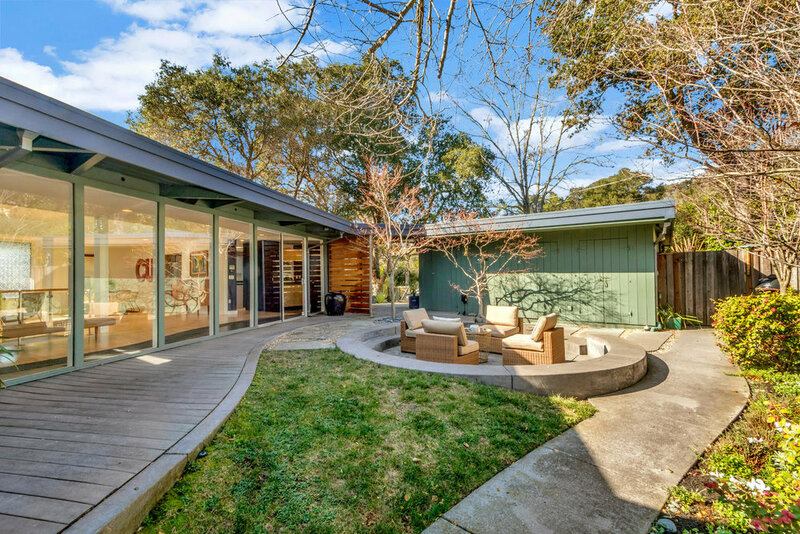 Three redwood clad soaring ceilings with skylights attest to the attention the builder gave to this, his own home on his favorite lot when originally built. Beautifully appointed throughout its almost 3,550 square feet of single level living with a meticulous attention to detail, this home features four bedrooms including a lower level bedroom suite with private entry ideal for guests, au pair or media room, and three and a half baths. Stroll through gardens bordered by redwoods to enter through your dramatic 7-foot pivot door into an oasis of tranquility illuminated with natural light from skylights and clerestory windows. A vaulted redwood clad ceiling adds volume to the stunning living room with its quartzite fireplace surround and soapstone cantilevered hearth. Hickory floors flow throughout the home. Two 9 ft wide Fleetwood window walls retract to connect to spacious Batu decks with fire pit, built-in stainless grill and ceramic Big Green Egg. 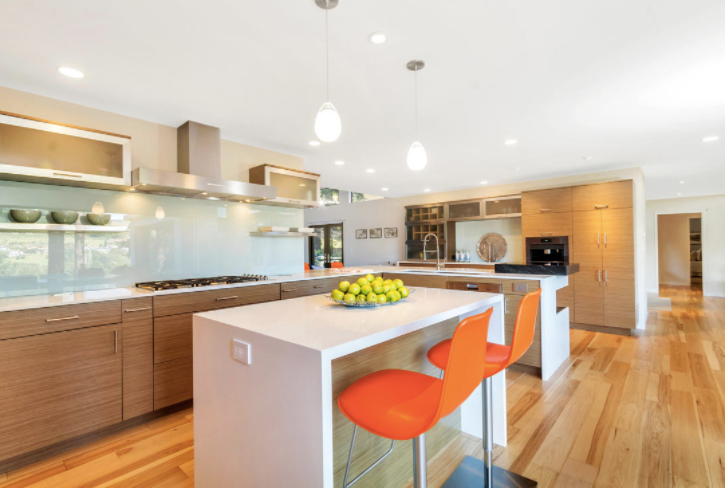 The custom kitchen has EcoWood walnut and stainless cabinetry, Miele appliances, custom paneled refrigeration and features Caesarstone countertops with waterfall edges. The beverage bar is easily accessed from all areas and is equipped with sink, wine storage, Miele coffee station and undercounter refrigerator. The adjacent family room has a vaulted ceiling and plenty of light with French doors to the front gardens. Convenient office space off the kitchen enjoys hillside vistas from the built-in desk and custom shelving. Spectacular views from the master are enjoyed in almost complete privacy or via a sliding door to decks. Up-lighting on the redwood clad vaulted ceilings gives the master an inviting glow and a louvred skylight brings in the stars when open. 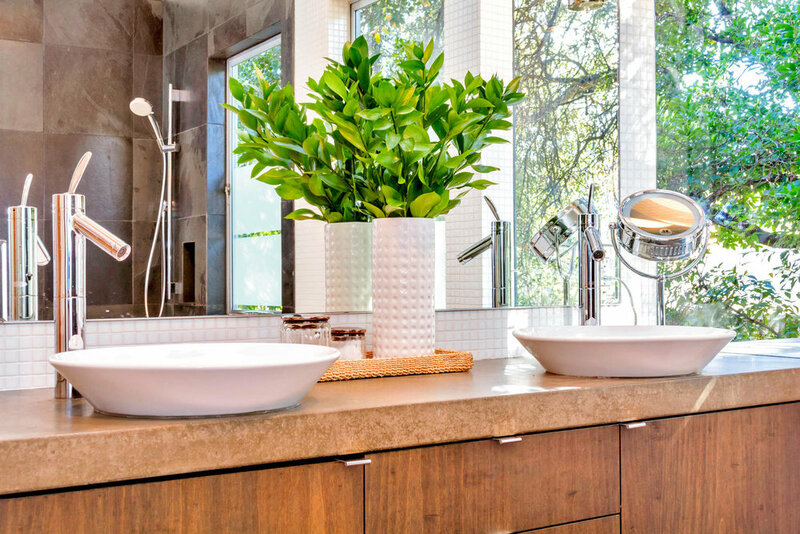 The master bath’s tree line view complements the Zen interior with free standing tub and large walk in shower. This premier gated property at the end of a private drive boasts not only a two car attached garage but also a 7 car detached garage. This bonus garage is ideal to customize into a guesthouse and garage, studio, office, collection showroom, workshop or two of the above! 77 Estates Drive is ideally located with easy access to Orinda shopping, dining, BART, Highway 24, and Orinda’s top-rated schools. NEW LISTING: RARE NEW CONSTRUCTION IN ORINDA! Remarkable new construction in the prestigious Country Club neighborhood showcases the superb craftsmanship of Jim Gray of McKenzie Gray Builders and the graceful designs of renowned Architect, Alan Page of Talon Design Group. Spanning approximately 4,000 square feet, this two level home with 5 bedrooms and 4 bathrooms, powder room, spectacular kitchen, two family rooms, study with fireplace and spacious master retreat leaves nothing to be desired. The outdoor entertaining venues on two levels include Connecticut Bluestone walkways and patios, a spacious veranda with built-in barbecue, sprawling lawns and terraced gardens surrounded by mature trees and privacy on a .48-acre lot. Enjoy top-rated Orinda schools, easy access to shops, restaurants, trails, freeway and BART.